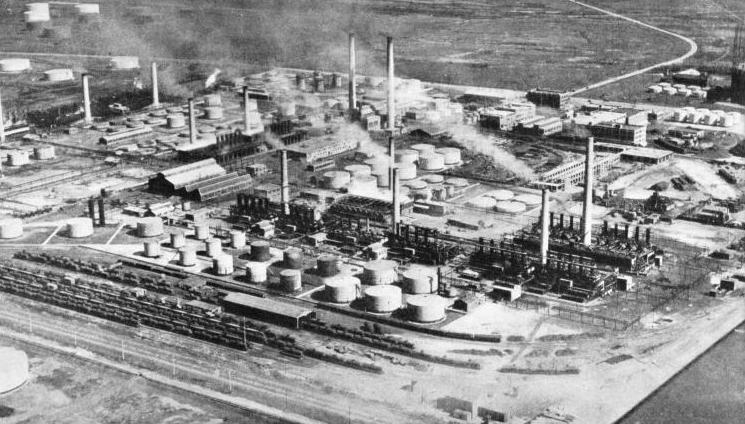 A GREAT OIL REFINERY at East Chicago, Illinois, in which crude oil is transformed into refined and graded oil and its by-products. The science of refining oil was originated by a Scot, Dr. James Young, nearly 100 years ago. Modern refineries vary in details according to the composition of the product and the demand of the market. The first main operation is splitting the crude oil into “fractions”. THE great oil industry is so vast and complex that it can be carried on only by huge organizations, prepared to spend immense sums on research and development. Crude oil occurs in the bowels of the earth; it may be sweet or fetid, clear as water, viscous as treacle, pale as whisky or black as tar, in all sorts of mixtures, with all sorts of impurities. From it may be separated gases, spirits, greases, wax and asphalt. These are covered by the all-embracing word - petroleum. The nature of petroleum is not easy to explain in simple language. The animal and vegetable worlds are built almost entirely of four familiar elements - carbon, hydrogen, oxygen and nitrogen, with a little, but important, help from one or two others. When one of these, carbon, which we know best as coal and soot, is united to hydrogen, which is the lightest of the gases, the result is called a hydrocarbon. Carbon has an unparalleled capacity for combining with other elements. The resulting molecules may be of a degree of complexity that is astonishing. Each of these compounds has marked characters of its own, so that most people are surprised to learn that natural gas, gasolene, benzol, kerosene, lubricating oils, paraffin wax, moth balls, turpentine, camphor, tar, pitch, asphalt and synthetic indiarubber are all hydrocarbons or mixtures of hydrocarbons. Let us imagine a ball with four hooks. That is an atom of carbon. Let us attach to each hook an atom of hydrogen (see Fig. 1 of the diagram below). That is the simplest of the hydrocarbons; for convenience it is often written CH4. It is called methane and generally known as marsh gas; it is the fire damp of the collieries and the will-o’-the-wisp of folklore and legend. Two of those carbon atoms might hook on to each other, and so leave only three spare hooks each for hydrogen. Then we should have two carbons and six hydrogens; so we can write it C2H6. This is called ethane (see Fig. 2 of the diagram). There is a whole series of this nature, to which chemists give the names methane, ethane, propane, butane and then, following the Greek numerals, pentane, hexane, heptane and so on. The more the carbon, the heavier they are and the higher the boiling point. At ordinary temperatures the first four are gases. This is called the Paraffin Series, and because all the hooks of the carbon are satisfied it is said to be saturated. By a slight change in the proportion of the two elements we have another series, the define Series, called unsaturated, because more hydrogen atoms could be attached. Here we get ethylene, propylene and butylene, which are normally gases, and amylene and others, which are liquids and solids. Still another formula gives what is called the Aromatic or Benzene Series, in which the carbon atoms form an inner ring and each carbon has one hydrogen atom linked on to it. So we see what endless changes can be rung on these series, and as many of them occur in Nature mixed together, and with other gases, the petroleum chemist has his hands full. Petroleum is believed to be caused by the decomposition of organic matter deposited in shallow lakes and lagoons, buried by silt, fermented by bacteria and bottled up by movements of the earth’s crust during geological ages. Being a fluid, it behaves in the same way as water, and is found in rocks that are porous or cracked, such as sandstones and limestones, regardless of their age. In some places, as in Romania and Mexico, there are great masses of brine in the ground, and petroleum is commonly found in the neighbourhood of these masses. As most petroleums are volatile, gas pressure is formed and the liquid is squeezed up the line of least resistance, so that it oozes out at the surface. Such oozes are called seepages. They are often marked by deposits of mineral wax, called ozokerite, as in Galicia, or of asphalt, as in the Caucasus and Trinidad. Where rocks are bent, folded or broken, the oil has a chance of moving about, and as it is lighter than water, it accumulates in arched beds in the upper part, the water remaining below. The tops of the arches are called anticlines, and that is why oil is generally looked for in anticlines, and the hollows or synclines avoided. If a borehole strikes the flanks of an anticline with oil in it, the oil comes gushing up, often violently. It is a natural mistake to think that the neighbourhood of a seepage must be a good place in which to look for oil. A seepage occurs low down on the flanks of an anticline; so a boring put down there would quickly pass through into barren ground below. The proper place to bore would be nearer the dome of the anticline, far above the seepage, so that the main mass of the oil may be tapped. Crude petroleum may occur in rocks of any age, for it is not the age that matters, but the consistency. Still, about half the world's output comes from the younger formations. Apart from free liquid oil, there are places where the ground is heavily impregnated with the petroleum, so that it can be obtained only by distillation. This happens with oil shales, such as those which have been worked in Scotland for many years, and occur in Estonia, Bulgaria and Sussex. The railway station at Heathfield (Sussex) has been lit for many years by natural gas emanating from deep petroleum shales. The trail of the oil-seeker is elusive. Oil may come seeping out in an arid plain, in a sweltering jungle, or from the bottom of the sea, or it may be ten thousand feet underground. The quest of oil is no haphazard hunting, but work for highly trained specialists. It is slow, often unhealthy, and always costly. Nowadays the discovery of oil is always due to reasoning. A preliminary survey is necessary. In new countries this may take months. Here the geologist is helped by the aeroplane, which gives a panoramic view of a region. This panoramic view enables the man in the study to form an idea of the region’s structure, so that he can direct the man in the field to the most promising district. At the same time there is formed a sense of proportion which would otherwise be gained only by laborious field work. A sense of proportion is particularly hard to acquire in dense jungles, where the ground must be cleared of the tangle of vegetation, in most arduous conditions, before the real search can begin. Modern methods have supplemented still further the work of the geologist. There is a sensitive instrument called the torsion balance, which can measure minute variations in the force of gravity over a district, and the concealed structure of the earth can be deducted from the evidence thus obtained. Another method is the seismic. Small earthquakes are created by firing big charges of explosive, and the effect measured by sensitive instruments some distance away. As earthquake waves travel more rapidly in hard, compact rocks than in soft beds, the results can be interpreted. Another method is the electrical, where currents are sent through the surface, so that the varying resistance of the rocks can be measured. The most expert geologist and oil prospector may be able to state whether oil is present in a particular district, but he cannot say in what quantity. A BLAZING GUSHER OF OIL will cause the loss of thousands of tons of oil. A fire is often started by sparks caused by the action on the steel casing of stones brought up by the gusher. This fire in Los Angeles, California, was started by the neighbouring grass catching alight. Before the blaze was extinguished three crude oil tanks were destroyed. The provision of adequate extinguishers is of vital importance. One of the best methods of putting out a fire in an oilfield is to use a foam containing carbon dioxide, which has the effect of a blanket and starves the flames of oxygen. It is not rare for the work of the geological staff to be confirmed by boring and for the presence of oil to be proved, but not in commercial quantities, so that all the labour and outlay are lost. Oil is extracted from the earth by deep holes called wells. They are only a few inches in diameter, but they may be nearly two miles deep. The art of drilling such holes is work for experts. It is full of difficulty, tinged often with romance, sometimes with danger. Drilling for oil is an ancient art. Two centuries before the Christian era the Chinese put down wells for oil over 3,000 feet with apparatus, which, though primitive, was in principle the same as modern plant (see the chapter “Artesian Wells”, beginning on page 119). The industry as such dates from 1859, when a Colonel Drake put down a hole at Titusville, in Pennsylvania. He was extraordinarily lucky, for he struck oil at 69 feet. A little distance away he might have gone 6,000 feet. The simplest method of drilling is by percussion with a bit at the end of a rope. The rope passes over the top of a derrick, to connect with a drum and winch. An eccentric moves a “walking beam” which imparts an up-and-down motion to the bit at the bottom of the hole. Another method is by the use of jointed rods instead of rope. The Raky process on these lines became famous before the war of 1914-18. Another system is by rotation, with chisel or crown. The crown is a steel ring with diamonds embedded in it - the hardest abrasive in existence. It is made to rotate rapidly, and so grinds down the hardest rock, the core passing up into the core-barrel. This method is slow and expensive, but is used for the sake of the samples when information is required about the nature of the ground. When the object of the hole is not information but oil, a specially designed bit is used, which is rotated so that it grinds down the ground to mud. The rods are hollow, and water is pumped down them. The water issues through a hole in the bit and rises up the borehole, forming a mud circulation, which washes up the debris and keeps the bottom clear for the action of the bit. The string of rods carrying the boring tool often weighs over 50 tons, and may exceed 100 tons. Raising a worn bit to the surface for replacement with a sharp one involves lifting the entire string, unscrewing each length of rod and stacking it. It pays, therefore, to have long rods, and long rods require high derricks. These are generally 100 feet high; for deep holes 178-feet derricks have been used. In a 122-feet derrick, with rods in 90-feet lengths, an expert crew is able to lift the bit, replace it and put the new one down to a depth of 5,000 feet in about three hours. A difficulty is to keep the borehole vertical. The boring tool is apt to drift, especially in slanting, hard ground, and deviations of hundreds of feet have been known. It is no easy task to survey a hole less than six inches in diameter and a mile or more long. When a hole strikes a deposit of oil under pressure, a gusher may ensue. In the popular mind this is the acme of success; but this is not so, for oil, sometimes in great quantities, is lost. There is, too, great danger of fire, as stones brought up by the jet may strike a spark from the casing, and a blazing gusher means the loss of thousands of tons of oil, unless rapidly extinguished, and that is difficult. With modern experience a “wild hole” is looked upon as the result of carelessness. 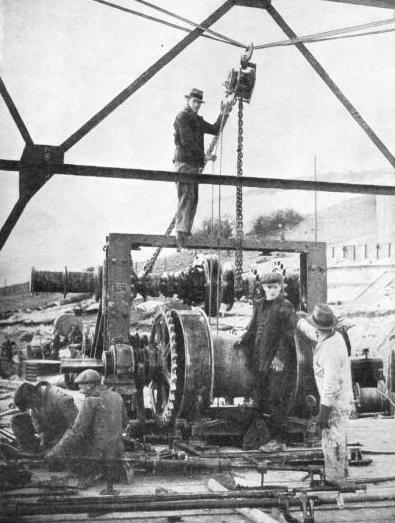 ONE OF THE LARGEST GUSHERS of oil in the world started from a well in Jefferson County, Texas, on January 10, 1901. The oil is forced up the well by natural pressure as soon as the underground deposit is tapped. The depth of this well is 1,300 feet. The danger is avoided by increasing the weight of the mud in circulation in the hole by letting in some heavy mineral, such as barytes or haematite, which can keep the hole under control even in high-pressure zones. The art of drilling is complicated and the work highly responsible. It calls for great care and experience, and good drillers command a high rate of pay. Americans and Poles have the best reputations as drillers. The next stage is to extract the oil out of the hole. Sometimes gas or water pressure may cause it to rise on the artesian principle. An artesian well is one in which fluid is obtained by boring through an upper impermeable stratum to a lower fluid-bearing stratum, the fluid being forced up by natural pressure. It is important to conserve such heaven-sent energy, or else much “dead oil” may be left in the ground. There is a steady decline of such pressure, but when it is exhausted it is sometimes possible to “re-pressure” the well by pumping back huge quantities of compressed gas, or by flooding it with water. Where the pressure is due to underground water, conditions may be ideal. The fields of Tampico (Mexico) and East Texas (U.S.A.) are thus favoured. If wells do not flow naturally, recourse must be had to artificial lift. The most general method is by the “beam pump”, on the principle of the suction pump. Such pumps have diameters of not more than 4-in, and strokes of 4-5 feet, and run at 10-15 strokes a minute. In some places it is possible to supply power from a central station to a large number of wells. Care must be taken to save the natural gasolene which often comes with flowing wells, and is valuable as well as dangerous. Sometimes the oil is so intimately mixed with water that an emulsion is formed. This can be stubborn stuff, and vast quantities have run to waste in the past; but now it can be split, either by chemical methods or electrically. Shales impregnated with oil have been worked for many years in Linlithgowshire, Scotland. Nearly a hundred years ago a Scot, Dr. James Young, produced excellent oil by distilling in a retort, and it was not long before several Scottish companies were supplying home and foreign markets with lamp oils from shale. To-day their descendant, a Scottish Limited Company, is refining and marketing in Iran. To-day oil shales cannot compete with natural oil, though they are worked profitably in some places. Still, they may be regarded as an ultimate reserve. The oil shales of the Wealden-Purbeck formation in Sussex are examples in the South of England. Crude oil is mixed and dirty, and it is not uniform in different districts, but the public demands a pure and consistent supply. The refinery, therefore, is the most important part of the industry after the production of the oil itself. Dr. Young was father of the art of refining oils. As long ago as 1847 he began on a seepage in a Derbyshire colliery, and when that ran dry he tried cannel (hard, bituminous) coal. This soon ran out, too, but his name, “coal oil”, persisted long after a petroleum product - kerosene, commonly called paraffin oil - had displaced this coal product. Then he turned to his native shales, and that was why, when the oil industry began in the United States, the Americans came to Scotland to learn how to refine it. Modern refineries vary in details with the composition of the product and demand of the market as much as the crude oils they treat. There are five main kinds of operations which may be involved. 1. Splitting the crude oil into “fractions”, that is into their component parts, according to demand. 2. The purification of such fractions, when necessary. 3. Special treatments, such as “cracking” and “hydrogenation” (explained below), which change the character of the components of the crude oil in important ways. 4. The recovery of by-products. 5. Sundry operations such as raising power by steam or electricity, storage, shipping of products, test laboratories, making tins, fire-fighting apparatus and so on. These processes are far too complicated to describe here; it is enough to say that the first important operation, as a rule, is the removal of any water that may be with the oil. The next step is distillation. The primitive method, by which the fractions were successively taken off as gas at their respective boiling temperatures, was soon supplanted by continuous distillation. This method is still in use. although about twenty years ago an improved form of continuous distillation, known as flash distillation, came into being. In this all the vapours are taken off at once and separated afterwards. The modern plant bears much the same relation to the primitive still as a modern water tube boiler does to the old-fashioned Lancashire boiler of the steam kettle type. There are numerous variations, such as vacuum distillation, which is used to keep the temperature as low as possible, when it is desired to keep the oil from being “cracked”. For the opposite reason, high-pressure distillation is sometimes resorted to. Then, there are various purification methods, such as the removal of sulphur, a common impurity. The refining of lubricating oils is an art by itself. It is vital, for instance, to eliminate any wax that may be present, and there are numerous solvent extraction processes for this purpose. All these are based on the fact that the various constituents of oils have different degrees of solubility in special solvents. Cracking is a mysterious word constantly heard in oil talk. The process is based on the fact that at high temperatures petroleum decomposes. Complex hydrocarbons, for instance, are broken down into simpler ones, and this process can be delicately controlled by the regulation of time and temperature. By this means material that is not particularly valuable - for example, heavy oil residues suitable only for use as liquid fuel - can be turned into much more valuable stuff, such as petrol. Cracking has been highly developed and plays a leading part in modern refinery practice. Motoring has led to such an increased demand for gasolene that the old straight method cannot meet the supply, and the difference is met by cracked gasolene. This type of gasolene has certain advantages for modern types of engine, with their higher compression ratio. Formerly, motor drivers’ requirements were easily satisfied in spirit and oils, but modern engine design has developed to such an extent that motor spirit and oils have to be specially designed to meet their needs. The association between the oil refiners and engine designers is especially close nowadays. 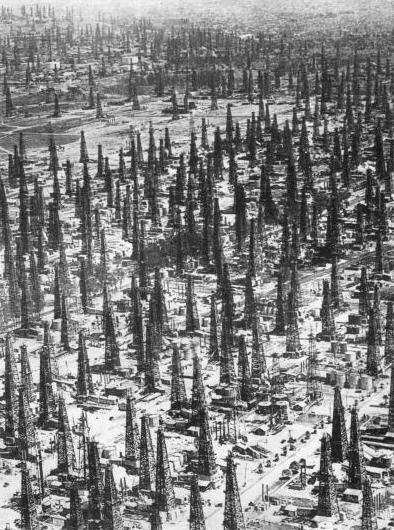 FOREST OF DERRICKS in a large oilfield at Signal Hill, in the Los Cerritos district of California. The derricks over oil bores are generally about 100 feet high, but for deep wells derricks as high as 178 feet have been used. Hydrogenation is the addition of hydrogen atoms to the oil molecules. The simpler hydrocarbons, which are the result of cracking, are “un-saturated”, so that more hydrogen can be added to them. The combined process of cracking and hydrogenation is carried out under high pressure, about 3,000 lb. to the square inch, and is effected with the help of what is called a catalyst, that is, an outside substance that seems to have some stimulating effect in bringing the reaction about without being affected itself. The rare metal molybdenum is used for this purpose, as also is tin. By varying the temperature and the amount of hydrogen which is added, the anti-knock quality of the gasolene may be altered. Gasolene, commonly called petrol in Great Britain and essence in France, is a mixture of hydrocarbons. Its essential property as a motor spirit is volatility, so as to make an inflammable mixture with air to be exploded in the cylinders. There are also numerous special spirits obtained from crude oil for various uses in industry, such as the exceptionally volatile spirit for petrol gas plants, and the heavier spirit, known as white spirit, for thinning paint. The rubber industry requires a heavy product for the solvent used in coating fabrics and a lighter one for the jointing of inner tubes. Highly volatile spirits are required for perfume extraction. Spirit solvents are used in the manufacture of balata (gutta percha) for golf balls and other purposes; also for the extraction of edible oils from certain seeds. Spirit solvents are used also in the treatment of bones for making glue and artificial fertilizers, and in the leather trade, in alcohol manufacture, in lacquer work, in dry cleaning, in paints and varnishes, to burn in miners’ lamps, for shower-proof garments, tarpaulins and oiled silks, for thinning photogravure inks, for linoleum, boot polishes and creams, and for floor and metal polishes. It is a list almost without end. Kerosene is another important product from crude oil, not so volatile as gasolene, but more so than gas oil. It was kerosene that brought mineral oil into the forefront of the fuel industry, as it was found to be far superior to fish and vegetable oils for lighting and cooking. For a generation the gasolene was burnt off as a dangerous waste product, but when motoring became popular the position was reversed. In 1899 more than half the crude oil was converted into kerosene. In 1932 the figure had fallen below 8 per cent. In 1935 Great Britain used 400,000 tons of kerosene, but 4,000,000 tons of petrol. Kerosene is now used as a convenient fuel for small stoves, for oil cookers, lanterns and lighthouses, and for power in tractors, motor boats and some light engines, and also as a “cutback”, that is, to dilute asphalt for road making. Gas oil, known in America as stove oil, and in Scandinavia and the Far East as solar oil, is heavier than kerosene but lighter than the lubricating oils. As its name implies, one of its uses is to enrich coal gas. It also provides diesel oil for driving lorries and omnibuses. Finally, after the removal of all distillates there is left residual fuel oil, the uses of which are almost without end. It is an ideal fuel for bakeries, and is also in demand for brick-making, cable manufacture and cement kilns, for core-drying in foundries, for crematoria, and for drying tea, coffee and cocoa. It is important in enamelling and in forging, especially in drop forge batteries; also in galvanizing, in the glass industries and many branches of metallurgy, in potteries, power stations and rotary kilns, in road making, salt baths, welding and varnish making. But most important of all is its use as the fuel which drives all the world’s leading navies and more than half its ocean-going merchant ships. Lubricating oils are of three main types, based on paraffin, on asphalt, or on a mixture of the two, with a wide range of viscosity and density. Many special oils exist, such as cutting oils for machine tools, and oils used in tanning, annealing, tempering, insulating transformers and cables, for conveying heat, for dust-allaying and for medicinal use. There are hair oils, oils used in chocolate and pastry-making, egg preserving, lacquer work, and making liquid soap and rubber, and oils for milk separators and knitting machines, and for such unexpected purposes as polishing currants and raisins. Then there are the petrolatums, of which petroleum jelly is a well-known commodity. BORING FOR OIL IN GREAT BRITAIN, at Portsdown Hill, near Portsmouth, Hants. The workmen are here seen fixing a winch to be used for the boring operations. Only after a careful survey by geologists was the Portsdown Hill site selected in the hope of tapping oil deposits nearly 6,000 feet below the surface. Paraffin wax is made from certain types of crude oil. Its manufacture is a complicated process and its uses are varied. The moat familiar use is for candle making. Vast quantities of candles are sold all over the world, particularly in the East. It is used also in waterproofing and insulation, dressing leather, for matches and boot polish, and in the manufacture of explosives, artificial flowers, various pharmaceutical preparations and chewing gum. Its value lies in its inert properties, as it resists the attack of many highly corrosive chemicals. Another important product is asphaltic bitumen. This occurs naturally in many lands. To-day it is mostly used in road making, in certain waterproof roofing materials and as an insulator of electricity and heat. There are places where the River Tigris is held in an embankment built with bitumen in the year 1300 B.C. and still sound after 3,000 years. Its use in the ancient East was extensive, but with the passing of the torch of civilization to Greece and Rome, the absence of accessible natural supplies drove men to the forests of Europe for pitch, tar, resin and turpentine. As soon as crude oil comes out of the ground it is sent to a “tank farm”, generally by a pipe line. Thence it is transported by tanker or pipe to the refineries. The first of the famous pipe lines was the one from Baku, on the Caspian, to Batum, on the Black Sea, built in 1897. To-day there are 120,000 miles of pipes in the United States alone. Tankers are self-propelled floating tanks that can handle any fluid; for besides oil, they take water to deserts, creosote to America, and whale oil from the Antarctic. They are divided into separate compartments, so that different oils can be carried, and also for greater safety in the event of damage. The average capacity is about 10,000 tons. Although their cargo demands special handling, particularly with highly volatile oils, a tanker will normally complete her “turn-about” in harbour in from thirty-six to forty hours. They are among the most efficient craft afloat and spend more time at sea than ordinary cargo vessels. There are about 1,300 tankers afloat on the seas to-day. Storage tanks of the familiar pillbox shape have a capacity from 100 tons upwards. The largest storage tanks in existence now are about 118 feet in diameter, and 43 feet high, with a capacity of about 13,000 tons of water. Concrete reservoirs were built in California some years ago to meet an emergency, and one of these measures 1,084 feet long by 503 feet broad, with a roof area of 11 acres and a capacity of 2,000,000 barrels. Light petroleum products do not catch fire of their own accord, but volatile products are highly inflammable and require great care in handling. In some fields, the atmosphere reeks of gas emanating from the ground, so that even a burning cigarette must not be within a mile of a field. Where oil is stored, the provision of adequate extinguishers is vital. The usual method of putting out an oil fire is by the use of foam containing carbon dioxide, which has the effect of a blanket and proves extraordinarily effective. 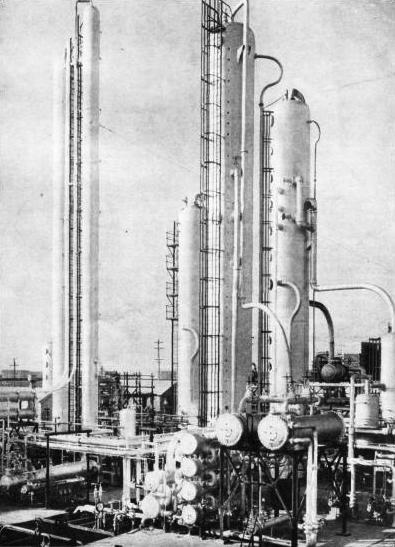 DISTILLING EQUIPMENT at the Dominguez Refinery, California, used for the manufacture of iso-octane, the basis of a special gasolene designed for aeroplane engines. The two columns in the background form part of the pressure distillate fractionating unit, and the column in the centre foreground is used to separate certain chemical components from the gasolene. Towards the close of the last century, there was talk of exhaustion of oil. The first warning came from the head of the United States Geological Survey, in 1889, which shows how little was known then, even in technical circles. About 1910 the world’s proven reserves were estimated at 24,000 million barrels, enough at the rate then current to last for sixteen years. To-day (1938), with improved methods of research, winning and recovering of oil - though it is impossible to say how long oil supplies will last - the possibility of a disastrous shortage is something which we can leave out of account as a practical possibility in our own lifetimes. Great Britain in 1935 imported nearly 10,000,000 tons of oil, including 400,000 tons of lubricating oil, 700,000 tons of kerosene, 2,500,000 tons of gas and fuel oil and 4,500,000 tons of petrol. It is often argued that it is dangerous for Great Britain to be so dependent upon overseas supplies, and that it would be better to produce oil from home coal. There are two processes to effect this at work to-day. At Billingham (Co. Durham) Imperial Chemical Industries are adding hydrogen to coal, and producing 150,000 tons of petrol a year. The other method, by low-temperature carbonization, is at work in several places, but here the petrol is a small by-product, the main product being a semi-coke. To supply the oil needs of such a country as Great Britain is an enormous business. The development of new oilfields is excessively costly and risky. The producing companies are generally owners of pipe lines, fleets of tankers, refineries and huge distributing organizations, supplying oil to countless homes, factories and wayside stations. The profits earned are large, but the investments and the risks are huge. Besides, the oil companies are of great financial importance to every Government. In Great Britain the amount received from duties on oil products is enormous. Under the Import Duties Act (1932) the Customs duty on hydrocarbon oils is 8d. a gallon. During the financial year ended March 31, 1932, the net receipts from Customs duty on oil were over £29,313,500. For the corresponding period ending March 27, 1936, the net receipts had risen to £45,187,710. If we add the duties on road vehicles using oil, we get as contribution from the industry to the State the colossal figure of £75,000,000. The United States of America are by far the largest producers of oil. Nearly three-quarters of the world’s oil supply comes from that country. 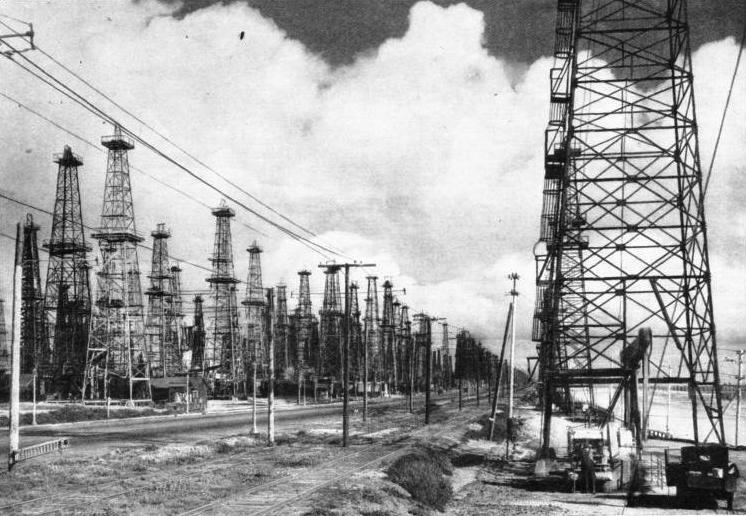 Mexico also is an important producer, but since 1925 her supply of oil has tended to decrease. In the Old World the great oil-producing countries are Russia, Romania and Iraq. 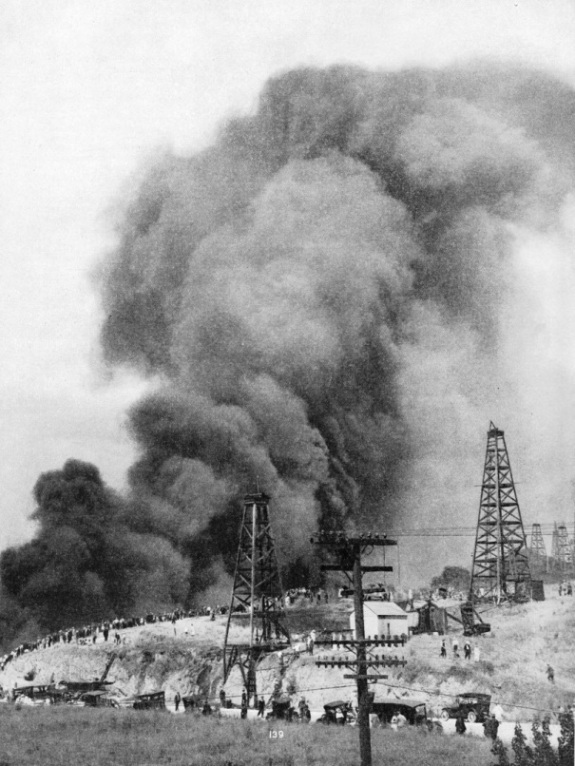 The oil wells in Iraq are under British control, though Iraq has been an independent state since Great Britain surrendered the mandate over the country in 1932. Oil has been discovered in Great Britain, but not yet in commercial quantities. In October 1918 the first British oil well was drilled at Hardstoft, Derbyshire, and by the end of May 1919 the well began to produce oil. Recently the yield has been at the rate of 2 tons a week. Oil has been found in small quantities in other parts of Great Britain as well. At Portsdown Hill, near Portsmouth, Hants, oil has been sought at a depth of nearly 6,000 feet. RAILWAY AND ROAD IN AN OILFIELD on the ocean front near Los Angeles, California. There are forty-two wells along the right of way of the Pacific Electric Railway in the Huntington Beach Oilfield. The American oilfields are among the richest in the world and a large proportion of the world’s supply comes from California and Texas. You can read more on “Oil Refining in Iran”, “The Oil Route from the East” and “The Story of Gas Production” on this website.